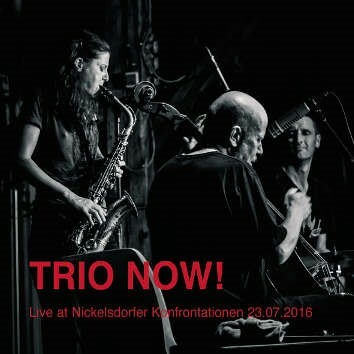 Three Austrian musicians who are keeping the flame burning for good old-fashioned free improvisation, Trio Now! have been chronically under-recorded, their only prior release being their self-titled debut from 2013. Even individually, alto saxophonist Tanja Feichtmair, cellist Uli Winter and drummer Fredi Pröll have very few recordings to their credit, which is unfortunate given that this is a very talented group, certainly worthy of additional opportunities to showcase their craft. On this, their second release, the trio perform before a highly enthusiastic audience at last year’s Nickelsdorfer Konfrontationen Festival in Austria, generating five wide-ranging improvisations between four and sixteen minutes in length, giving the players ample opportunity to stretch out individually and collectively. The longer pieces, “The Magic of Now” and “Susi” cover the widest spectrum of emotional registers, from delicate, almost chamber-like intimacy to buoyant and aggressive eruptions. Feichtmair plays with superb control, as even on her most ecstatic explorations she’s never in danger of losing the tether that connects her to her bandmates. She can transcend the jazz idiom altogether, and frequently does so, yet at times there remains a tenuous link to a bop-based language, something that emerges toward the end of “Magic of Now” as Winter and Pröll have a dalliance with pulse and a hint of swing. Winter utilizes a range of techniques on cello, as evidenced by his expert use of arco on the first half of “Magic of Now,” but he’s just as effective with his percussive thunderings on “Susi.” Pröll is similarly versatile, providing subtle texture through sparing accompaniment on the ironically named, subdued “High Voltage,” but also capable of driving the group at its most boisterous moments, especially in the rambunctious finish to “Susi,” where Feichtmair unleashes a torrent of upper-register outbursts as Winter and Pröll match her intensity and passion. The group can be quite irresistible when giving voice to its most exultant expressions. The more muted moments are somewhat less satisfying by comparison: the opening stretch of “Proximity” suffers because of what sound like Feichtmair’s quiet vocalizations getting lost in the mix—what amounts to an engineering problem, essentially—and a couple of the other pieces seem to meander for a while before they really get moving. But when the band locks it in, a great deal of energy and excitement results, as on the all-too-brief encore “Good Night Friend,” where the musicians’ exuberant farewell leaves their audience satisfied but eager to hear more. Hopefully we’ll get that opportunity with more recordings from this fine trio.